Matthew graduated with a BSc Psychology degree in 2016, and now works with young people with autism using Applied Behavioural Analysis (ABA). He was directed towards the ABA method during his BSc Psychology course at LSBU. 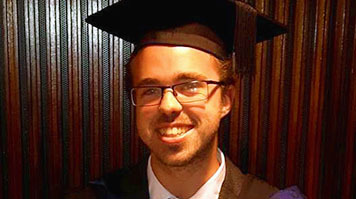 "I got my present job about a quarter of the way through my third year at university when we did a module, ‘ABA and Autism’," Matthew explains. "Because of the lectures I attended on this module, I was able to achieve the Registered Behavioural Technician (RBT) credential, which not only improved my CV, but meant I was offered my current job delivering ABA programmes." Matthew works for a service called Real Focus, which is owned by Dimensions, a charity that supports people all over the UK, of all ages, that have a learning disability and/or autism. "Real Focus is a specialist home programme, where we support young people with autism with severe challenging behaviour, to learn new independent living skills and functional communication, by using ABA and PBS (Positive Behaviour Support) principles," Matthew explains. "This allows them to live happier and more independent lives." No two days are ever the same. I could be working with over 3-4 different clients a week. Today, for example, I drove a client from his own home to college in his own car, before heading to the office. Tomorrow, I may be doing assessments before supporting a client to go swimming, or helping him to learn new road signs and how to sign for a break. Naturally, Matthew's job involves some difficult moments, and he freely acknowledges that he sometimes encounters hurdles: “I have my fair share of bad days, so it’s important for me to identify why I’m not doing so great. I just have to tell myself that everyone makes mistakes, and figure out how I can learn from it. Through experience, Matthew emphasises how important it is to start getting work experience and learn about your strengths as early as possible. "Think about the people that you want to work with and try to get a part-time job working with them," he suggests. "I started working for an agency during my second year for adults with learning difficulties. I then got a job in a care home doing the same job, but I still learnt. I then got this job a year ago and heading on for bigger and better things. Start wherever you can and stick with it. You will get contacts eventually and learn a ton in the meantime." Learn to sell yourself. Use every little bit of success to your advantage. Don’t lie. Even if you think you haven’t achieved much, you’re wrong. You’re just thinking about it wrong. For example, if you babysat your little sister while your mum and dad went out for dinner, you have experience caring for young children. If you have a sister with autism or a brother with bipolar, you have experience with those disorders or client groups. Use anything you can to your advantage. Matthews experiences have been a great help in considering his future steps: "I now know that I want to progress further in this field. I applied to do a Master’s in Behavioural Analysis and Therapy and have heard only last week that I have been accepted with a conditional offer, which only requires a clear DBS check. Without my degree, the support of Dr Clodagh Murray, my experience with young people and adults with learning difficulties and autism, and the RBT credential, I would not have even considered this. "With the Master's, I will be able to work towards applying for a more advanced credential, called a BCBA, which will allow me to work in supervisory and managerial positions." You can connect with Matthew on LinkedIn.